There is no doubt that iTunes is important for everyone who is using an Apple device. Not only you have to manage your music through iTunes, but everything related to an Apple device has to be managed through the software. If you turn on and then encrypt the iPhone backup in iTunes, then it certainly is a good thing, because you are protecting your data. However, forgetting the password can be troublesome. Should that happens, you will no longer be able to restore, or backup your data, and it will be inaccessible. 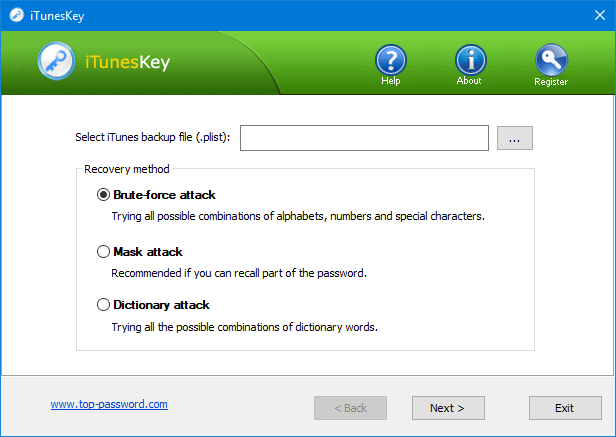 The good thing is that with the help of iTunesKey, you can actually crack or recover the backup password of iTunes, and remove it. There are countless programs that guarantee to crack the backup password, and work, but not all of them do what they promise. The features of iTunesKey are listed below. Offers a GUI that is simple and easy to understand. Users can recover passwords for iPhones backup, as well as iPad backup. Recovers access to everything that is encrypted in the backup. There are multiple recovery options available. Supports GPU acceleration, allowing for faster cracking. There are a fair number of reasons why you should use the iTunesKey; I am going ot mention the main ones. 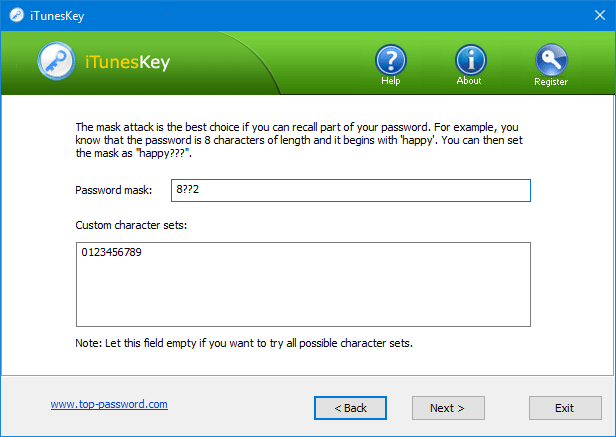 If you have forgotten the password of your iTunes backup, then using the software becomes a no-brainer. It will help you reset your password as fast as possible; plus, it has different attack methods that will make the unlocking experience much easier, and convenient for those who want more options. 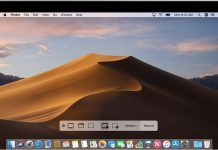 If you are in search of a software that is fast, reliable, and works in all the cases, then going for iTunesKey is the smartest thing you can do because the software does work as it is intended to. Sure, you may have already experienced several other options similar to this, but hardly any of the alternatives work. 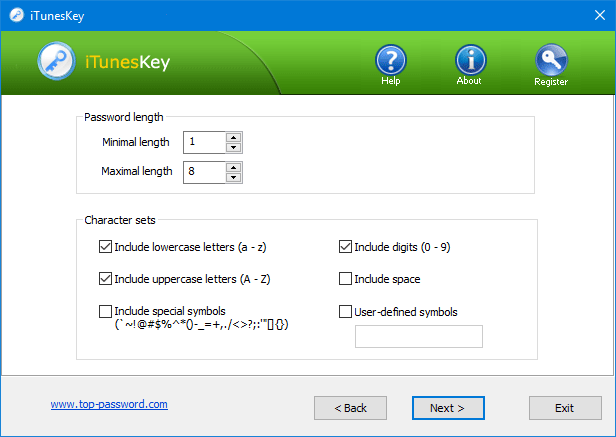 Thankfully, I have personally tested the iTunesKey, and it works in all the cases, but the efficiency solely depends on how complicated or simple your password is in the first place. The good thing is that the installation process is fairly simple and straightforward. You can download the software by heading over here. Users have the option to buy the software, or use the free version. Once the download is complete, you can go ahead and run the software. The user experience of the software is extremely good. Once you are done installing the software. I would suggest you locate the “Manifest.plst” file. 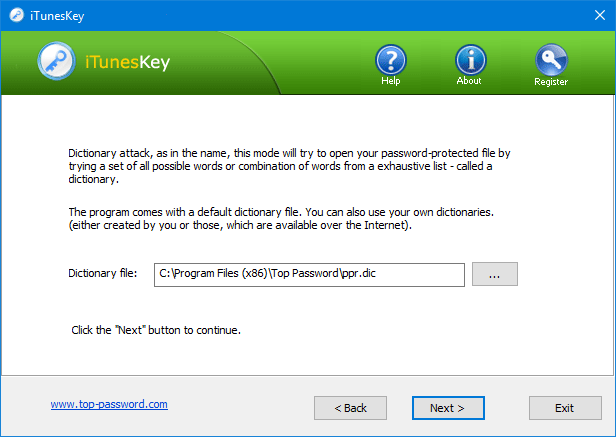 This is the file where iTunes stores your backup password on the file. The directory in which the file is found is located the directory below. However, the Manifest.plst file is hidden, so make sure that you have chosen the option to show hidden files in Windows Explorer. Once you are done relocating the, you can go ahead and launch the iTunesKey. Once you launch the program, you will be presented with the following screen. Once the program has launched, click on the … button, and select the Manifest.plist file that you have just copied to a convenient location. If you choose the Brute-force attack, then the software will start cracking your password by guessing all the possible combinations, this process can take really long depending on how complicated or strong your password was in the first place. Choosing the Mask attack is good if you remember a part of your password, then clicking Next will bring you to a new window where you will enter the part of the password that you actually remember, and hit next. Lastly, the Dictionary attack will go through an extensive list of words that are in the dictionary. The software does come with its own dictionary file, but in case you want to use your own dictionary, you can simply use it by selecting it from the menu. Whatever method you choose to get your password, I have to tell you that the required time is going to be there. For those wondering, the time solely requires on how complicated your password was in the first place. 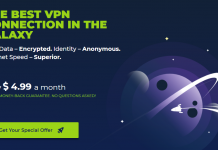 The good thing, however, is that if your computer has a graphics card, then the software can take full potential of the graphics card, and will unlock the password even quicker. The more powerful the graphics card is, the sooner your password will be cracked. Once your password has been required, you will be presented with this screen. You can then get access to your data, and restore it. You can even change the password should you wish to. It is that simple. Honestly, when I first heard about the iTunesKey, I did not know if this is going to be a viable solution. That is mainly because I have had my fair share of experience with bad software solutions that promise to deliver a lot, but just fail in when they are actually tested. The good thing is that iTunesKey did not fail; it delivered on all the promises it made, and I am quite happy with the results. However, in the midst, of all the good things, I must say that the fact that the software relies heavily on the graphics card makes it amazing, and not so amazing. Amazing because for those with powerful graphics cards, it will take time much shorter than the time it will take on computers with weaker, or no graphic cards. 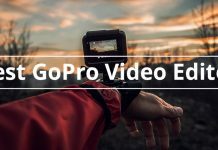 Extremely intuitive and easy to use. Multiple methods of cracking the backup password. Works on almost all the versions of Windows. The GPU acceleration feature makes it even better. The cracking process can take some time if the computer does not have a graphics card, or has a one that is not powerful enough. How to Recover Lost Data from iPhone? 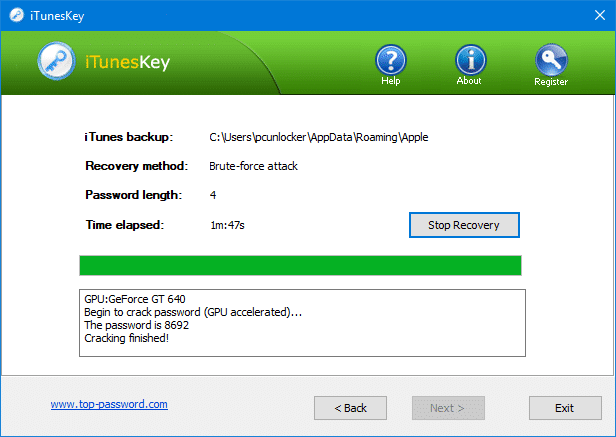 How To Recover iTunes Backup Password? How to Recover Deleted Text Messages from iPhone and Android?